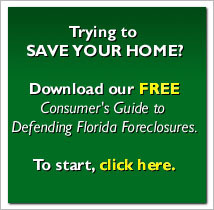 Mike is a founding partner of Ricardo & Wasylik, PL, a Florida law firm that helps homeowners fight foreclosure, mortgage fraud, and foreclosure rescue scams. He has represented a clients in a wide variety of matters, including lawsuits in courts all over the state of Florida. Mike graduated from the Florida State University College of Law and has been admitted to practice law since 1995. Send e-mail through the firm website.